Fig is among the twenty main fruits exported by Brazil, which is the eighth largest producer of fig in natura in the world. The characterization of active germplasm banks (AGBs) of fig has thus become an important line of research, as it is necessary to gather information from this to carry out adequate management projects. The objective of this study was to characterize the morphologies of 42 fig tree accessions, so that the quality and genetic potential of different accessions of the species could be recognized based on the characteristics of the vegetative parts of the plants. Estimates of variance components were obtained for each variable evaluated using the restricted maximum likelihood/best linear unbiased prediction procedure, available in the genetic-statistical software SELEGEN. The majority of the characters analyzed had a genotypic coefficient of variation lower than the environmental coefficient of variation. However, all characters had non-zero heritability, showing that there is genetic variability among the accessions related to the characters tested. The population studied has medium to high genetic variability, indicating that it is possible to identify the materials based on morphological descriptors, among which the number of lobes of the leaves appeared to be the most promising. The common Fig tree, Ficus carica L., is a fruit tree belonging to the family Moraceae, which is able to adapt to a wide diversity of climates. It is cultivated both in warm subtropical regions and in temperate climates (Flaishman, 2008). According to Barolo, 2014), in addition to its use as an important source of vitamins and minerals in the supplementation of human diets, Fig has been used to improve poor health conditions, since its fruits, leaves, and latex have been reported to act as antioxidants in diabetic mice (Pérez, 2003), inhibitors of low-density lipoprotein (LDL) oxidation in humans (Mawa, 2013), and inhibitors of cancer cell proliferation (Rubnov et al., 2001). In addition to these interesting features of Fig, ficiculture is characterized as an activity carried out in rural areas, which contributes to the survival of family farms and acts as a source of income for small and medium producers. Therefore it is of great importance to the social balance of the rural population, generating more jobs in the field because it requires labor throughout the year. However, the commercial cultivation of the Fig tree in Brazil is exclusively based on the planting of a single cultivar, ‘Roxo-de-Valinhos’, which is characterized by its high vigor, productivity, hardiness, and wide acceptance by consumers and the industry (Ferreira, 2009). This predominance of a single cultivar results in serious pest and disease problems, such as Fig rust (Cerotelium fici), Fig tree borer (Azochis gripusalis), and Fig fly (Zaprionus indianus), which hinder cultivation and depreciate fruits, reducing profits. This practice also makes Fig trees very susceptible to the nematode Meloidogyne incognita, which attacks the roots of the plant and forms gall, harming its development and requiring high expenses for crop inputs and cultural treatments for this pest (Brito et al., 2008). Thus, research aiming at finding solutions to some of these problems would make an enormous contribution to the development of ficiculture, such as by allowing the use of resistant cultivars as an important strategy. Considering that genetic diversity is an important component of the survival of a species and its adaptation to changes in the environment, the characterization and maintenance of such diversity in existing active germplasm banks (AGBs) becomes a fundamental strategy for the improvement of the culture of species like Fig (He, 2016 ). Within this context, the objective of the present study was to perform a morphological characterization of accessions in the AGB of Fig (Ficus carica L.) belonging to the Faculty of Engineering of Ilha Solteira (FEIS) of UNESP through quantitative descriptors. This was done to support future studies on the conservation and genetic improvement of this species. This study was carried out using forty-two 15 year-old Fig tree accessions, belonging to the Active Germ-plasm Bank (AGB) of Fig at the Teaching, Research, and Extension Farm of the Faculty of Engineering of Ilha Solteira (FEIS) of University of São Paulo State (UNESP) – Ilha Solteira Campus, located in the municipality of Selvíria, MS, Brazil (Latitude 20°22′S, longitude 51°2'W, altitude approximately 335 m). The climate of the region is ‘Aw’ (i.e., Tropical savanna climate or tropical wet and dry climate) according to the classification of Koeppen (1948), with an average annual temperature of 24.5°C (average maximum of 27.5°C and minimum of 21.4°C), relative air humidity of around 64.8% (annual average), and a pluviometric index of 1232 mm (average) distributed from October to March. The soil is classified as dystrophic Red Latosol, a moderate, very clayey, hypodystrophic, kaolinitic, ferric, epicompact, very deep, and moderately acid soil, according to the Brazilian Soil Classification System. Production fertilizations were performed according to soil analysis results and recommendations of Raij, (1997), in the projection of the crown of the Fig trees, with the soil devoid of mulch. Phytosanitary treatment was carried out with bi-weekly applications of Bordeaux mixture (1%) intercalated with mancozeb (200 g p.c./100 L of water) to control Fig rust (Cerotelium fici Cast. ), and Methyl Parathion (100 mL/100 L of water) to control Fig borer (Azochis gripusalis Walk. ), applied alternately. To protect the soil against erosion, maintain soil moisture, and control weeds, mulch was used in the inter-row spaces after pruning. Irrigation was done using a drop tube system 3 times a week, with an average precipitation of 2.0 mm/h reaching an area of 50 cm width in the planting row. This was considered to result in an average coefficient of class A tank (Kp) of 0.75 and a crop coefficient (Kc) for Fig trees equal to 1. The number of lobes per leaf in the first fruit of the single stem of each plant was counted. Length and width of the leaf blade (cm) and petiole length of the leaves (cm) were also measured with the aid of a graduated ruler. Statistical analyses were carried out on the biometric results from all accessions in each evaluation period. The averages obtained were compared using Scott Knott test at a 5% probability significance threshold. The software Statistical Analysis and SISVAR, version 4.0 (Ferreira, 2011) were used to perform statistical analyses and experimental planning, respectively. Estimates of the variance components were obtained for each variable using the restricted maximum likelihood/best linear unbiased prediction (REML/BLUP) procedure available in the genetic-statistical software SELEGEN – Computerized Genetic Selection developed by Resende, (2007). The statistical model used was: y = Xr + Zg + e; where: y is the data vector; r is the vector of the repetition effects (fixed) added to the general average; g is the vector of genotypic effects (random) and "e" is the vector of (random) errors. The capital letters represent the matrices of evidence for these effects (Resende, 2007). The components of variance and descriptive statistics calculated were genetic variance, residual variance, heritability (h2), genotypic (CVg) and environmental coefficients of variation (CVe), overall average of the experiment for all variables, and the CVg/CVe ratio. To assess the genetic divergence among the accessions in terms of the biometric characters of their roots and leaves, the generalized Mahalanobis distance was used (Matos, Munõs and Gonzáles, 2013). The genotypes of different accessions were separated from one another using the software GENES (Cruz et al., 2006) to generate the dendrogram. The treatments examined, with the respective accessions used therein and their places of origin are presented in Table 1. IAC: Agronomic Institute of Campinas; IP: Irradiated Plant. Table 1. Identification of the 42 fig tree (Ficus carica L.) accessions used for morphological and agronomic descriptions of leaves and fruits in this study, performed at Selvíria, MS, in 2017. The characterization and evaluation of plant species consists of establishing an identity for each access, through the knowledge of a series of data aiming to describe the different accessions of a collection of germplasm, using characteristics of interest. Cruz, 2014 mentioned that the characters studied may be morphological, physiological, cytological, biochemical, or molecular, and should include attributes, characteristics, or traits of a culture that are informative and useful for the characterization and evaluation of specific types (i.e. accessions) of the studied species. Most of the morphological characteristics of Fig leaf accessions examined in this study presented a genotypic coefficient of variation lower than the environmental coefficient of variation and had heritability values ranging from 0.25 to 0.40. However, traits in all accessions were found to have non-zero heritability, showing that there is genetic variability among the accessions in the characters tested. Estimates of genetic parameters for these characteristics are presented in Table 2. Table 2. Variance components and genetic parameters for leaf length, leaf width, number of lobes, and length of petiole of adult fig tree accessions. Although the findings of Cowart and Graham (1999) indicated that the length and width of the leaves are not good biometric characteristics, it is worth noting that higher values of these traits in combination with other characteristics can help in determining possible selection characters. Castellen et al., 2007, characterizing 68 accessions of the Active Germ-plasm Bank of Papaya of Embrapa mandioca and tropical fruit through multivariate analysis, detected that the components 1 (petiole color) and 2 (leaf length) explained most of the total observed genetic variation (67.80%). In this sense, despite the low heritability observed for these characters in the Germ-plasm Bank in question, accession 15 (‘Troyano’) stands out from the other accessions due to its above-average leaf area, with leaf length and width of 30.3 cm 25 cm, respectively. The number of leaf lobes showed high heritability (0.85), with a CVg/Cve ratio higher than 1. In a study by Domiciano et al. (2015) on genetic parameters and diversity in progenies of macaúba (Acrocomia aculeata), estimates of heritability varied between 50.24% and 71.9% (height and length of the rachis, respectively). According to that study, these values were considered high, especially when analyzed together with those obtained for the coefficients of genetic (CVg) and environmental variation (CVa) (CVg/CVa in most cases approached 0.5). In this study, the same authors concluded that it is possible to improve the recognition of morphological characteristics of a species through the selection of promising genotypes. For the number of leaf lobes character, the values observed ranged from 3 non-pronounced to 7 well-defined lobes; these extremes were observed in accessions 15 (‘Troyano’) and 13 (‘Brunswich’) respectively (Figure 1). Figure 1. 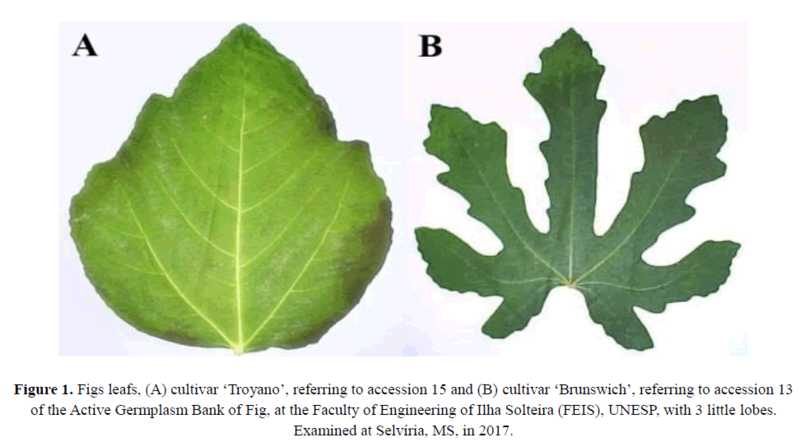 Figs leafs, (A) cultivar ‘Troyano’, referring to accession 15 and (B) cultivar ‘Brunswich’, referring to accession 13 of the Active Germplasm Bank of Fig, at the Faculty of Engineering of Ilha Solteira (FEIS), UNESP, with 3 little lobes. Examined at Selvíria, MS, in 2017. According to Giraldo (2010), who analyzed Fig varieties, the selection of highly discriminant descriptors is important to optimize the resources necessary for a viable and reliable morphological characterization. This is especially important in cultures that have accessions stored in germ-plasm banks with high numbers of homonyms and synonymy, as is in the present study. In this case, a rapid characterization of the germ-plasm with this list of descriptors would reduce the number of redundant accessions, which would allow human and financial resources to be invested more efficiently into the accurate evaluation of quantitative descriptors in different years and places of cultivation. An adequate descriptor should allow the distinction between different accessions from the same culture to be feasible and also should be useful, avoid redundancy, be environmentally stable, and be easily manipulated by the breeder (Grum and Atieno, 2007). For example, biometric data, which have an important ecological value in helping to determine the variability within a species, allow researchers to identify and differentiate phenotypic parameters among the individuals of a population, which constitutes one of the most important sources of variability available for crop improvement (Röper et al., 2015; Palace, 2016; Stojanović et al., 2016). Further analyses to infer the structure of genetic distances among the Fig tree accessions in terms of leaf phenotypic characters were obtained by using Generalized Mahalanobis Distance methods, with a dissimilarity matrix and clustering determined by Ward's hierarchical grouping method. The grouping of these accessions is represented by the dendrogram in Figure 2. Figure 2. Dendrogram obtained based on the Generalized Mahalanobis distance calculated in terms of 4 characters (leaf length, leaf width, number of lobes, and petiole length) among adult Fig leaf accessions using Ward’s method. The dendrogram obtained by grouping the accessions shows that the individuals from the Fig tree AGB studied could be divided into two large, well-defined hierarchical groups. However, the groupings formed within these had very different hierarchies, with the formation of subgroups with greater or less dissimilarities among themselves. In this sense, it was observed that, within each large group, there were large subgroups, containing small subgroups composed of very genetically similar individuals. For example, the first large group was formed by treatments 25 to 26 (Figure 2). Within this large group, four large subgroups, consisting of treatments 26 to 30, 32 to 39, 8 to 38, and 13 to 25, occurred, indicating a structured population for the characters analyzed. In this case, the treatments 8, 29, 11, and 38 of the first subgroup were very similar to each other but formed a distinct subgroup when compared to the other genotypes. In the second large group, consisting of treatments 16 to 26, although there was a clear visual hierarchy the genotypes grouped more easily than in the first group. Three subgroups were formed, which contained accessions with phenotypes similar to each other. This demonstrates the distance between the large groups 1 and 2, with the latter being the least divergent among its accessions. The number of lobes was the most promising leaf morphological character among those examined in this study due to its high heritability and high genetic correlation. When analyzing variation in this character among accessions, the dendrogram showed low structuring among the accessions, indicating that this is a unique character for each accession. Thus, it was observed that the population studied had medium to high genetic variability, indicating that it is possible to identify the materials from different sources within it. The use of cultivars adapted to different climatic conditions, soil, and production systems is a fundamental principle used to improve the productivity and quality of any fruit or vegetable (Mba, 2012). Therefore, the generation of new and more productive cultivars with superior qualitative characteristics, such as fruit color, flavor, odor, texture and color of the pulp, sugar content, acidity, and resistance to transport, among others, has been a significant challenge in the breeding of fruit plants. According to Frankham (2005), genetic diversity is the key to a species’ survival and adaptation to changes in the environment, and a fundamental task for scientists is to elucidate the mechanisms of the origin and maintenance of this variation (Platt et al., 2010; Huang et al., 2014). In addition, detailed information on genetic variability can be applied to reveal the demographic and structural history of the population of a species, and the genetic mechanisms behind its local adaptation and evolutionary changes (Hansen, 2012; Mita et al., 2013; Berg and Coop, 2014). The characterization of genetic diversity within germplasm banks is thus a key initial step in the successful growth and expansion of the culture of Fig tree crops. The main role of heritability is related to the fact that it expresses the reliability of the phenotypic value as an estimator of the genotypic value, such that the higher the heritability in selection (Acquaah, 2012). In the present study, the coefficient of heritability at the level of number of leaf lobes, determined through analyses of morphological differences of vegetative parts, the accuracy of genotype selection and the coefficient of genotype variation were significant, suggesting that this character may be promising to be a selection character for the identification of Fig trees of different genotypes in Brazil, where propagation is done primarily by cloning. It was possible to characterize Fig tree accessions based on quantitative analyses of differences in the morphology of their leaves, to allow the selection of strains of this crop with desirable traits. Moreover, the most divergent accessions were found to be ‘Genovesco’, ‘Brunswick’, ‘Troyano’, ‘Palestino’, Accession 21, Accession 34, Accession 38, Accession 39, Accession 41, and Accession 42. These divergent accessions had characteristics of agronomic interest, which may thus be used in future studies on genetic improvement programs of the Fig tree crops. Genetic analyzes at the DNA level, such as SSR molecular markers, will also be used to correlate the treatments belonging to the BAG in question. The authors give thanks to the University of São Paulo State "Júlio de Mesquita Filho", Ilha Solteira and Dracena Campus, for the research assistantship postdoctoral development in Agronomy provided to the first author, and to Fundação de Amparo à Pesquisa do Estado de São Paulo (FAPESP), for financial assistance to the project. The data in this article were not submitted to any public database. Conceptualization: Rodrigues, M.G.F. ; Boliani, A.C. Data acquisition: Santos, T.P. ; Neves, V.A.B; Monteiro, L.N.H. Data analysis: Pavan, B.E. ; Rodrigues, M.G.F. Design of Methodology: Rodrigues, M.G.F; Ferreira, A.F.A. W. Writing and editing: Rodrigues, M.G.F. ; Monteiro, L.N.H. ; Ferreira, A.F.A. Castellen M Da S, Ledo CA.Da S, Oliveira EJ De, Monteiro Filho LS et al., (2007) Caracterização de acessos do Banco Ativo de Mamão por meio de análise multivariada. Magistra, Cruz das Almas-BA, 19: 299-303. Cruz Cd (2006) Programa Genes - Estatística Experimental e Matrizes. 1. ed. Viçosa: Editora UFV, v.1. 285p., (im Portuguese). Grum M, Atieno F (2007) Statistical analysis for plant genetic resources: clustering and indices in R made simple. Handbooks for Genebanks, Bioversity International, Rome, Italy. Köeppen W (1948) Climatologia. México: Fondo de Cultura Econômica. 478p. Martos G, Muñoz A, González J (2013) On the Generalization of the Mahalanobis Distance. In: Ruiz-Shulcloper J., Sanniti di Baja G. (eds) Progress in Pattern Recognition, Image Analysis, Computer Vision, and Applications. CIARP 2013. Lecture Notes in Computer Science, vol 8258. Springer, Berlin, Heidelberg. Raij B Van, Cantarella H, Quaggio JA, Furlani AMC (1997) Recomendações de adubação e calagem para o estado de São Paulo. 2. ed.rev.atual. Campinas: Instituto Agronomico/FUNDAG, 285p. Resende MDV (2007) Sistema estatístico e seleção genética computadorizada via modelos lineares mistos. Colombo: Embrapa Florestas, 359p.